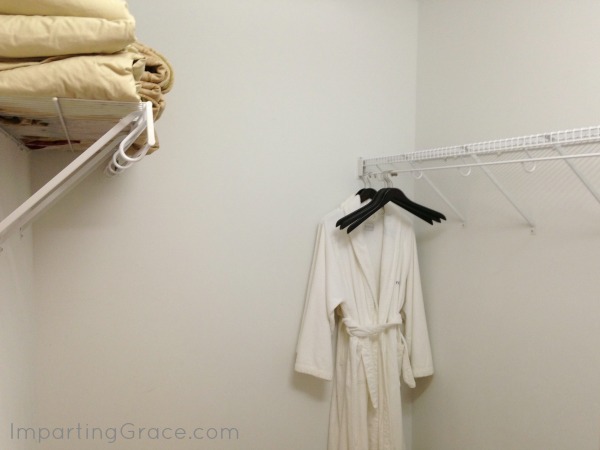 I'm so excited to share with you a new space in my home! 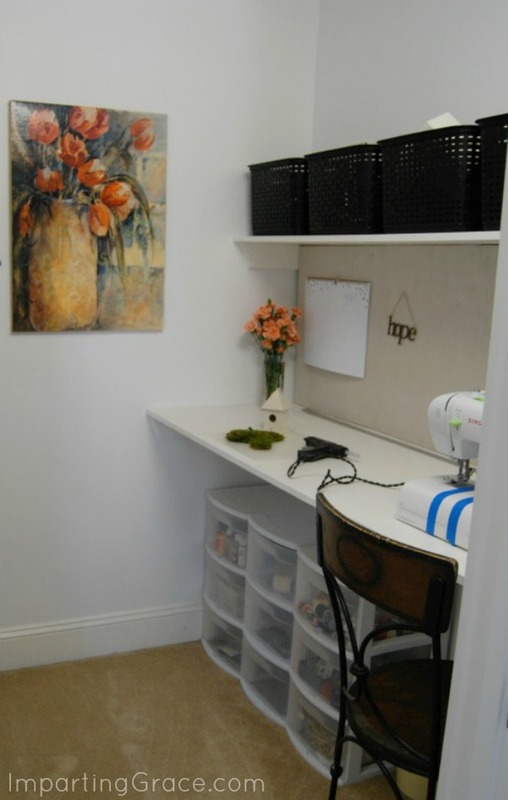 My friend Angie from The Country Chic Cottage is sharing tours of beautiful craft rooms this week, and I'm honored to participate. 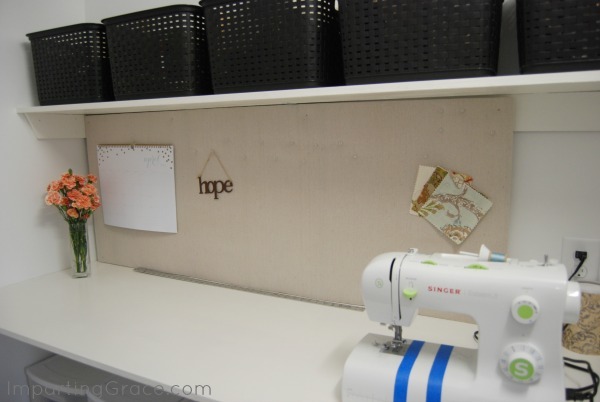 I don't quite have a craft room, but I do have a special space to share! Let me tell you how this little space came about. First I should say that we're blessed to live in a large house, with lots of space for most everything. There's room for reading, writing, working, playing, cooking, entertaining, exercising, relaxing--you name it, and we've got room for it. Except for one thing. There was no place for me to craft. No place for my tools and supplies, no spot for me to perch and plan and create. Let's face it--crafting is usually a fairly messy process, and there was no dedicated space for it. So I kept my things stuffed into cupboards and closets and pulled them out to the kitchen whenever I wanted to make something. Someday soon, when my boys are all grown up and out of the nest, I may have a dedicated room for crafting. 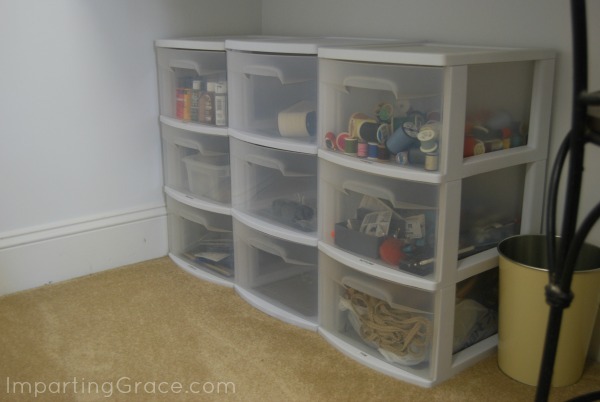 For now, I just wanted a place to work, store my materials, and keep my sewing machine set up! And then one day, when I was changing the sheets on the guest room beds, it hit me. See that door to the left? Guess where that leads? 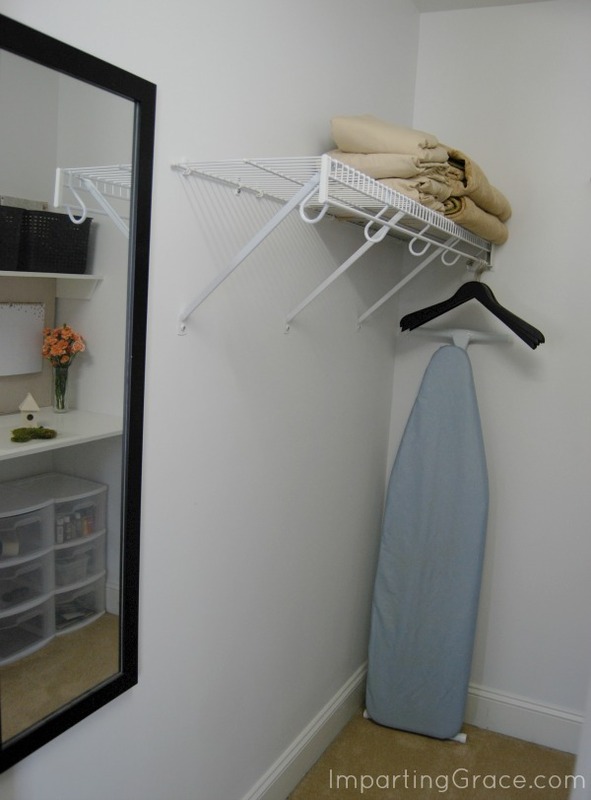 I had this large guest room closet, nice and bright and empty. I've worked very hard create a welcoming space for guests, and I didn't want to mess that up. But that was a lot of unused space! So I measured and drew and schemed and planned and enlisted the help of the friendly wood cutter at Home Depot. 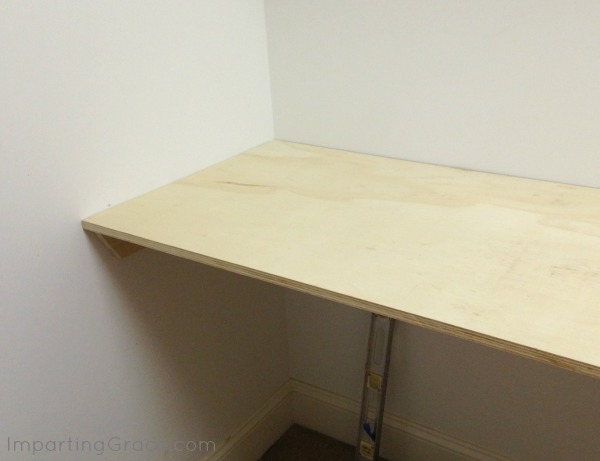 I removed the old closet rack from one side of the guest room closet and, aided by my trusty level, I mounted 1x6's to serve as brackets for a work surface and a shelf. 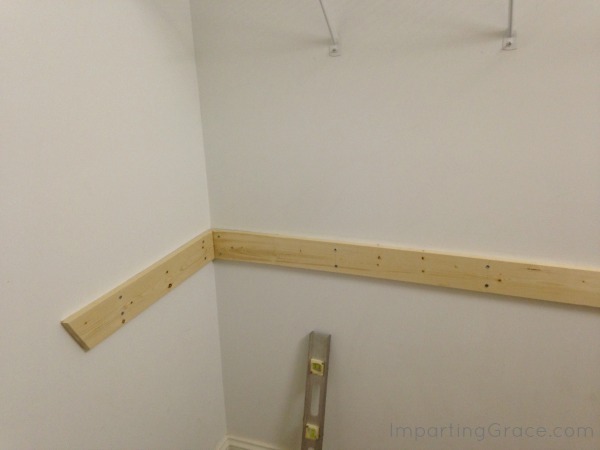 A pro would have mounted the 1x6's with nails, set the nails, and puttied over them, for a perfectly smooth surface. I'm no pro, so I cheated: using my drill, I attached the 1x6's to the studs with screws. They're not pretty, but they're secure. Holding my breath, I placed the sheets of wood that I'd so carefully measured atop the brackets. Perfect fit! Sanding and white paint finished off the job. And now. . . I have a space for crafting! While my electrician was here doing some work, I had him add an outlet to the desk area. I was planning just to run an extension cord from the bedroom into the closet, but it's so much nicer to avoid that mess. 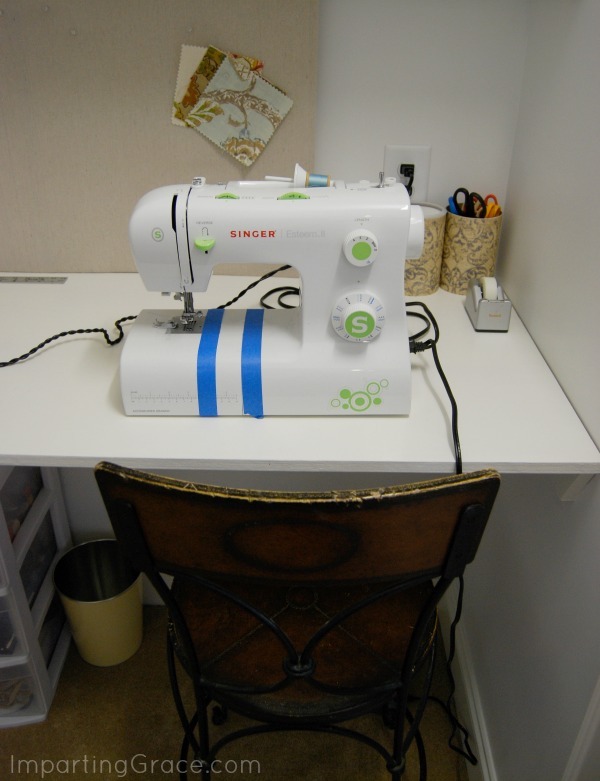 And my sewing machine is right at home! You can probably tell from looking at my sewing machine that I'm not an expert seamstress. Those lines of tape are there to help me sew straight seams! But my little machine and I get the job done, and we have lots of fabric stored underneath the beds in the guest room. 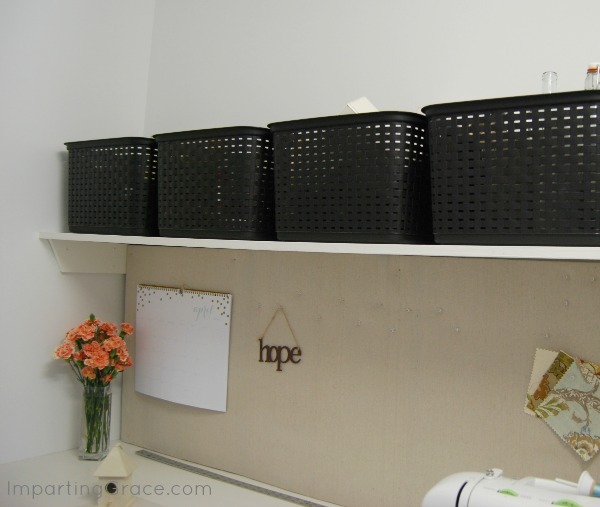 I added baskets on the shelf to hold craft supplies. (These are made by Sterilite--they're plastic and quite sturdy but look a little nicer than most plastic baskets.) You can see a few things peeking over the tops of the baskets, but mostly things are kept neat and hidden away here. 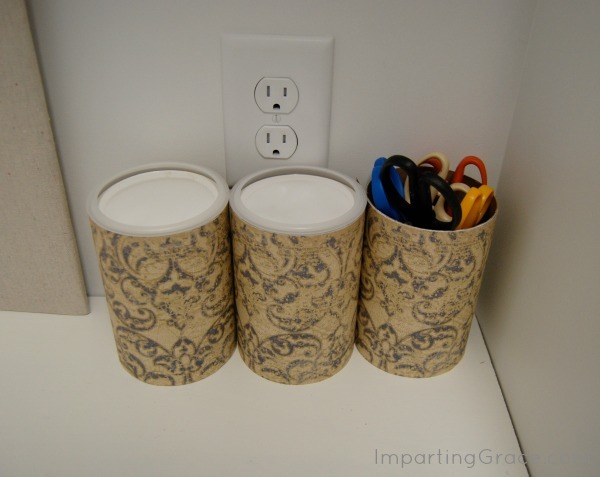 I needed a few desktop organizers, so I covered some oatmeal containers with scrapbook paper from my stash. Free. I figured that a large bulletin board might come in handy on the desk top, so I created one by covering pieces of foam core board with batting and drop cloth. Easy and inexpensive. Among other things, I like to keep an ornament of the word "hope" hanging there, a reminder of one of my favorite verses, Romans 15:13: "Now may the God of hope fill you with all joy and peace in believing, that you may abound in hope by the power of the Holy Spirit." Thanks so much to Angie for inviting me to participate in her Craft Room tour! I'm joining Sarah at Thrifty Decor Chick for her April Before and After party. love your little craft hide away. Admire how disciplined you must be to keep to just those few baskets and drawers! What a great idea! 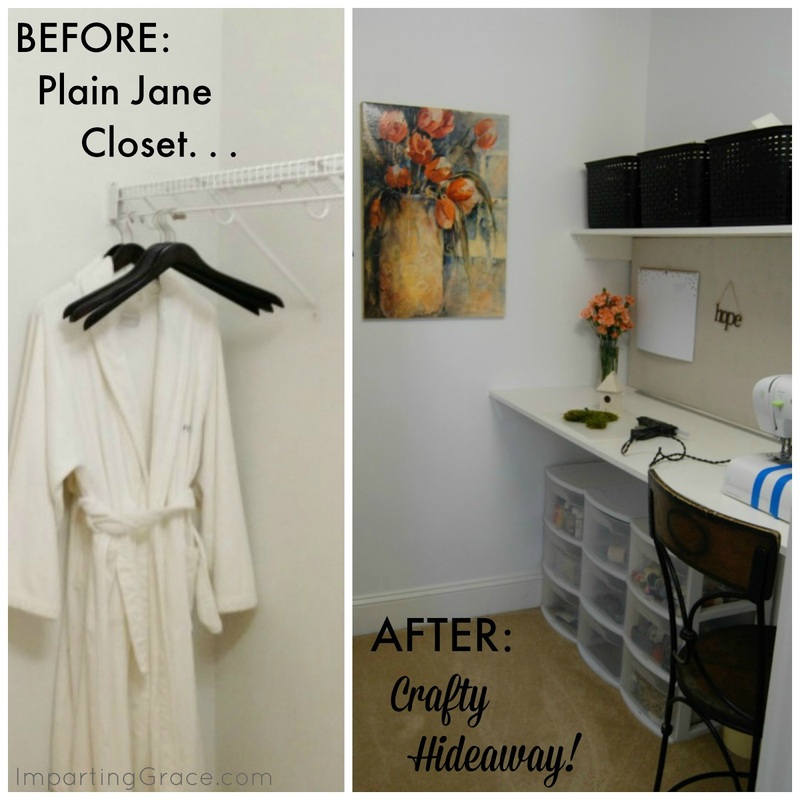 Your craft closet looks amazing! Richella, Got to say I love the space you've created. You are ingenious! I love the painting of the tulips-you'll probably tell me you painted it yourself. Wow is all I can say. I'm not a seamstress but a quilter and I have tape on my machine for the same reason(I blame it on my eye stigmatisms-that I can't sew a straight line). Thanks for sharing!!!! What a great use of space! 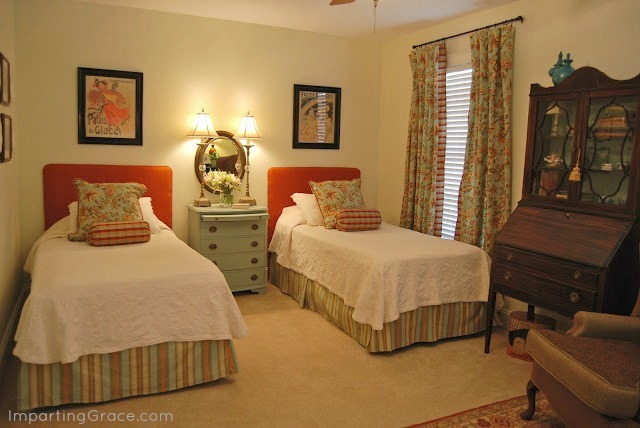 And that bedroom is gorgeous! Well, aren't you the clever one. I can't believe you had an empty closet. Mine are full. It's so pitiful. First and foremost, I do not know anyone who has an empty closet, so that was the first thing that impressed me!! Secondly, I think this is just perfect, it's like a "playhouse" and I think I need one in my home, too!! And if you have a mess, you can just close the door - couldn't get any better than that!! 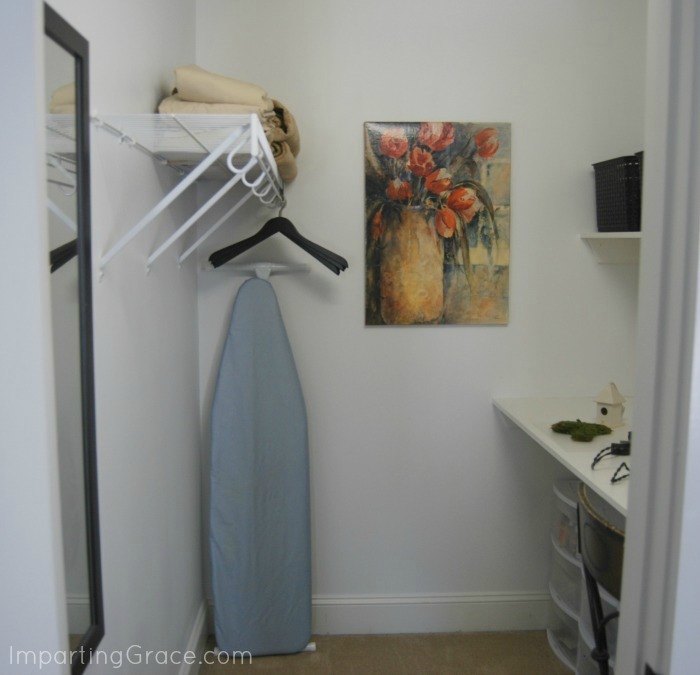 That's a wonderful space, Richella! You will have so much fun! 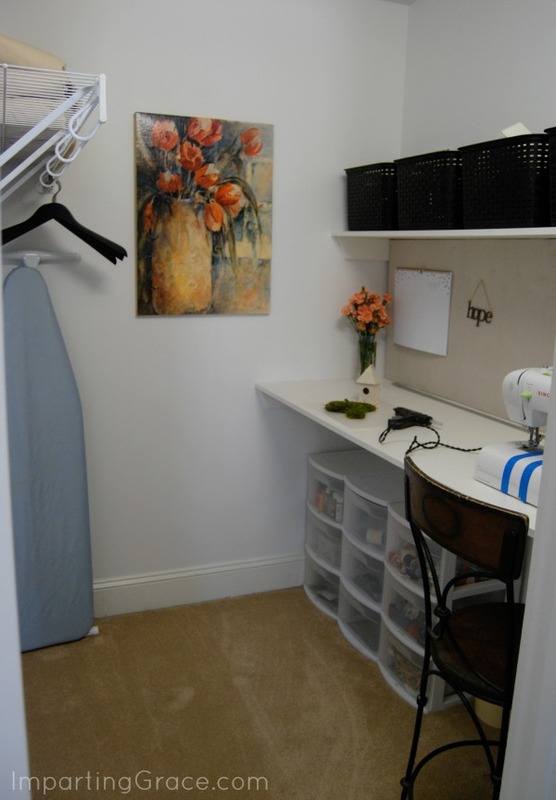 My first crafting/sewing space was not much bigger, and I was running a sewing workroom out of that small space. You just have to be creative, and then you can make whatever size space work. Have fun! Now that is thinking outside the box! What a wonderful way to use this space. I love it! Also, thanks for sharing your tip using tape to sew a straight line. One I will use from now on. I've been trying to turn my third bedroom in to a "creative room" for three years! That is so ingenious. You did a great job of really utilizing that space. 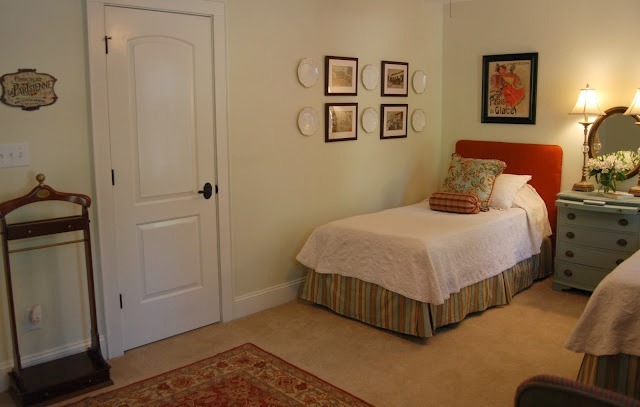 Your guest room is beautiful.